H&M stores now double as clothing-recycling locations courtesy of a new incentive-based recycling program. One of the most popular clothing companies is getting in on the eco-friendly action by launching the very first garment-recycling initiative. It is none other than H&M. At Global Green USA’s 10th annual pre-Oscar party last month, H&M celebrated its new clothing-recycling program, along with its partnership with Global Green. The brand new initiative, which went into effect in February 2013, allows customers to exchange any used garments, from any brand, in any condition, at each of H&M’s 269 (and growing) U.S. stores and 48 markets worldwide. This will help avoid textile waste, save natural resources and reduce environmental impact. 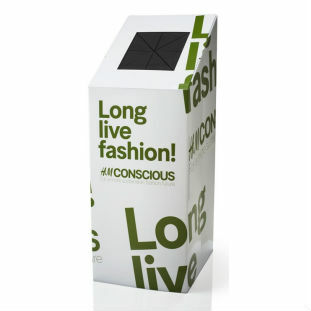 Similar to other recycling programs, H&M offers an incentive. For each bag of clothing donated, customers will receive a voucher worth 15% off of their next purchased item. “We believe this program will really make an impact in reducing the amount of clothing that ends up in landfills all over the world and we are excited that, at the same time, we will raise funds for Global Green USA to continue their great work,” H&M Continental Communications Director Marybeth Schmitt said. The funds raised by H&M will benefit Global Green’s projects, including constructing green buildings, rebuilding communities suffering from climate change and sea level rise, and helping communities damaged by hurricanes Katrina and Sandy. At the green bash, H&M also had an exclusive “Conscious lounge” highlighting its sustainability measures and its Conscious clothing line, which showcases sustainable fashion benefiting the planet. The Conscious line includes tops, jeans, scarves, underwear and other items designed from organic cotton, recycled polyester and other eco-materials. The collection is available online for purchase for women, men and even kids! As you can see to the left, actress Sophia Bush showcased H&M’s Spring 2013 Conscious Exclusive collection by wearing a beautiful ivory organic cotton three-piece suit. It’s not easy being green, particularly for a massive apparel retailer like Hennes & Mauritz (HMB), but it can be profitable. The world’s second-biggest retailer has a fascinating new plan to cut waste in the fast-fashion business it helped create. It is offering discounts to consumers who turn in their old clothes at H&M stores. The initiative started in February and will be in all of H&M’s 2,900 or so outlets by the end of the year. It’s a brilliant piece of green marketing by H&M’s corporate responsibility staff. But the company’s number-crunchers deserve some credit, too; they have carefully constructed the program in a way that makes it hard for H&M to lose. For every bag of clothes (regardless of brand), the Swedish retailer gives a small discount. On its corporate website, H&M says it will offer £5 ($7.70) off a purchase of at least £30. On its U.S. site, H&M promises a voucher for 15 percent off one item per bag of old knickers and pajamas, with a limit of two vouchers per day. In other words, H&M is not granting discounts of more than 17 percent—and less as shoppers spend more. That’s a commendable amount, but not overly generous for a company that routinely posts a gross profit margin around 60 percent and a net profit margin around 15 percent. H&M also sells the castoff clothes, subsidizing the discount further. Say a London customer donates a bag and then buys £40 worth of skinny jeans and H&M’s David Beckham-brand underwear. If the retailer sells the used clothes for just £1, it has conceded just £4 overall—a 10 percent discount, effectively—and is probably still in the black. H&M, which did not respond to phone calls and e-mails this morning, notes that revenue from the returned garments will be used to offset the rewards, but it will also donated to local charities and groups working on recycling innovation. Meanwhile, customers get to feel virtuous about shopping at H&M, a pitch that’s been hard for the company to make in the wake of the garment factory fires in Bangladesh. H&M, which has more of its clothes made in Bangladesh than any other apparel company, quickly agreed to sign a legally binding agreement to improve building safety there.